We have been in business for over 40 years and specialize in decals and dry transfers as well as higher quality models and detail parts. 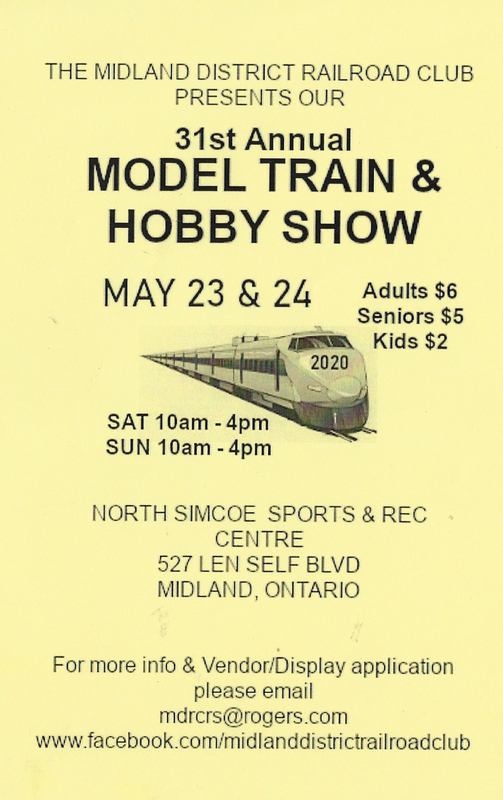 Besides our internet presence, we attend numerous train shows each year around Southern Ontario. Check the list in the upper right for upcoming shows. We bring all of our stock to the shows - so anything you find on the website can be picked up at the train shows. If you want something held for you to pick up at one of the shows - please email me - sales@tmrdistributing.com. Also note that special pricing online may be different than the specials we offer at the shows. We will honour online prices at the shows if you bring us a copy of the product page showing the online price. The quickest way to find items is to use the search box at the top of the page to quickly locate items. You can enter stock numbers or key words to find items and you can also select a specific category to search in. You can also search using the MANUFACTUER list on the right. The decline in the value of the Canadian dollar will result in higher prices on new stock. The current rate is around 30-35%. Any replacement stock will be at a higher price than it was last year. US customers may save 20-30% due to the exchange rate. Adding items to you shopping cart DOES NOT hold these items for you. Until you actually checkout and pay - anyone else can purchase these items. Due to the nature of the hobby business these days - many items cannot be restocked once sold out. NOTE: 99.9% of the items listed as being in stock on this site are actually in stock - however - the .1% are items that are listed as being in stock - but have been stolen or misplaced at train shows. One or two items seem to disappear at every show and unfortunately in most cases, I do not know the item has been gone missing until someone orders the item and I am unable to locate it. In the event that an item you have ordered has disappeared - I will advise you. If an alternate product is available - I may be able to substitute the item. This is a very frustrating issue - but it seems that common items like wheelsets, small parts, decals and Kadee couplers are the most common items to disappear at the shows. All manufacturers A-LINE ABERDEEN CAR SHOPS ACCU-CAL ACCURAIL ALCO MODELS ALEXANDER SCALE MODELS AMERICAN LIMITED MODELS AMERICAN MODEL BUILDERS AMERICAN SWITCH & SIGNAL ATHABASCA SCALE MODELS ATHEARN ATLAS BACHMANN BERKSHIRE VALLEY BETHLEHEM CAR WORKS BLACK CAT BLAIR LINE BOWSER TRAINS BRANCHLINE BROADWAY LIMITED CABOOSE INDUSTRIES CAL-SCALE CALUMET CAMPBELL ROAD DRY TRANSFERS CAMPBELL SCALE MODELS CANADIAN PROTOTYPE REPLICAS CANNON & COMPANY CANTOR RAIL SERVICE CARY CDS LETTERING CENTRAL HOBBY SUPPLY CENTRAL VALLEY MODEL WORKS CHAMP DECALS CIRCUITRON CITY CLASSICS CLOVER HOUSE CMA CNRHA CRMPG CUSTOM FINISHING DANS RESIN CASTING DAVID L ELLIS CO. DEPOTS BY JOHN DETAIL ASSOCIATES DETAILS WEST EVERGREEN HILL DESIGNS FALLER FRONT RANGE PRODUCTS GARY BECK ENTERPRISES GLOOR CRAFT GOLD MEDAL MODELS GRANDT LINE GREAT WEST MODELS GREG KOMAR GSB HAMILTON MODEL WORKS HERALD KING HI-TECH DETAILS HIGHBALL GRAPHICS INTERMOUNTAIN RAILWAY CO. IRISH TRACKLAYER ISLINGTON STATION DECALS JL INNOVATIVE DESIGN JUNECO SCALE MODELS K&S KADEE KATO KEIL-LINE PRODUCTS KEMTRON KEYSTONE MARK VAUGHAN MASTER CREATIONS McHENRY COUPLERS McKEAN MODELS MICRO BRUSH MICRO ENGINEERING MICROSCALE MID-MICHIGAN SCALE SIGNS MIDWEST CAR & FOUNDRY MILLER ENGINEERING MINIATRONICS MINIATURES BY ERIC MLR MFG. MLW SERVICES MODEL POWER MODEL RAILROAD SERVICES MOLOCO MV PRODUCTS NEW ENGLAND RAIL SERVICE NJ INTERNATIONAL NMRA NORTHWEST SHORT LINE ORO DECALS OVERLAND MODELS OZARK MINIATURES PACIFIC FAST MAIL PECO PECOS RIVER BRASS PIKESTUFF PLANO MODEL PRODUCTS PLASTRUCT PRECISION SCALE MODELS PROTOTYPE MODEL INDUSTRIES Q-CAR COMPANY QUALITY CRAFT MODELS RAIL POWER PRODUCTS RAILCAD RAPIDO TRAINS REBOXX RED BALL RED CABOOSE RED CAP LINE RIX PRODUCTS ROUNDHOUSE RUN 8 PRODUCTIONS S&S HOBBY PRODUCTS SAN JUAN CAR CO. SCALE SCENICS SCALE SHOPS SCALE SIGNS SCALE STRUCTURES SCHOMBERG SCALE MODELS SEA PORT MODEL WORKS SELLEY SEQUOIA SGS SHAUN ARTHUR SHELLSCALE SMOKEY VALLEY PRODUCTS STANDARD CAR COMPANY T2 GRAPHICS TAHOE MODEL WORKS TESTORS TICHY TOMAR TRACKSIDE PARTS TRAIN STATION PRODUCTS TRAINS CANADA TRUE LINE TRAINS UTAH PACIFIC WALKER MODEL SERVICES WALTHERS WESTERFIELD WOODLAND SCENICS YELLOWSTONE CUSTOM SERV.